The weather is finally warming up across the country, which means it’s time to open the barn windows and get out the cleaning supplies! The fresh start that spring brings is the perfect opportunity to clean and organize not only your home, but also your barn, your tack, and your horse. Here are a few things that we recommend checking off your spring cleaning list! Get to the bottom of your tack trunk. When was the last time that you actually took everything out of your trunk? Whether you’re coming off a winter show circuit or just gearing up for your first show of the season, the spring is a great opportunity to take everything out of your trunk, deep clean, re-organize, and maybe even re-locate that glove you thought was long lost! Evaluate, eliminate, and replace tack as needed. 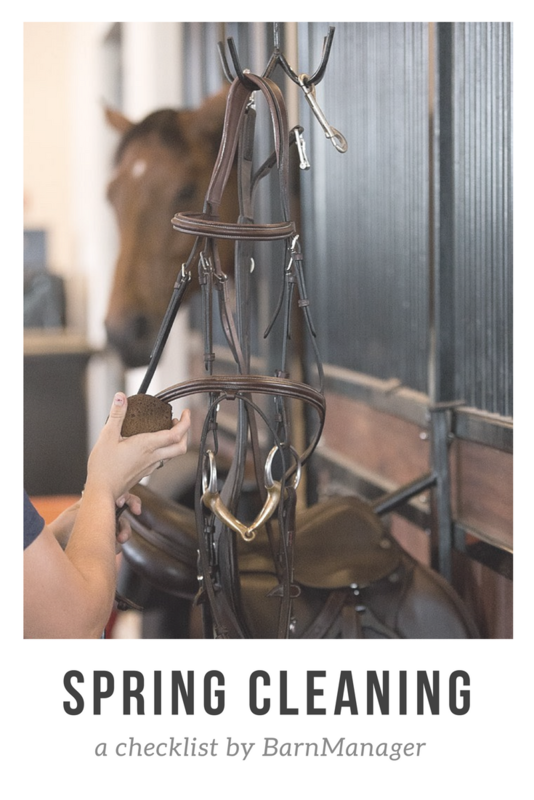 As you’re going through your tack trunk, also evaluate all of your tack and equipment. If there’s something that you no longer need or want, consider donating it to a horse rescue or therapeutic program or taking it to a local equine consignment shop. Now is also the time to replace any broken or overly-used tack or equipment or stock up on new items for the summer. Send blankets out for cleaning and repair. By the end of the winter, it’s likely that your horse’s sheets and blankets are in need of a deep cleaning! Depending on your area, some exceptional blanket cleaning services are available to clean and repair your blankets and then carefully wrap and pack them for safe keeping until cooler weather returns. Get spring vaccinations. Make sure that your horse is up to date on all vaccines and has a recent coggins test. Have those teeth checked. While your vet is there for vaccinations, or if you use an equine dentist, now is the time to have them float your horse’s teeth and check for any potential dental issues. Stock up on fly repellant products. In most parts of the country, the onset of warmer weather also means the onset of more flies! Stock up on fly sprays and any fly masks or sheets. having them serviced. Don’t have a fire extinguisher? 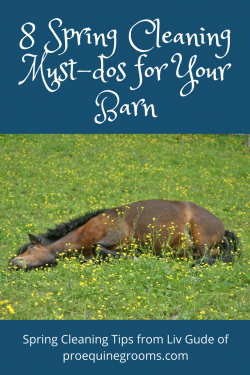 Add getting one to your spring list, as every barn should have at least one! Clean out gutters and downspouts. Clear out any leaves or build-up that may have accumulated over the fall and winter months. Inspect your pastures. Walk the perimeter of all pastures to check the fencing and locate any weak or broken spots. Thoroughly clean any run-in sheds, and walk your fields and fill in any holes. BarnManager makes it easy to simplify your spring cleaning and organization! After your horse gets its spring vaccines, snap a picture of the shot records, and upload it straight to your horse’s profile in the BarnManager app! Have a long list of spring cleaning to-dos? Make the list within BarnManager and even share it with fellow barn members, clients, or staff to assign tasks or accomplish the to-do list together! Plan your spring and summer show schedule directly within BarnManager’s calendar for easy access by everyone within your barn! Sign up to try a free trial here! Time to do a few things around the farm to get ready for warmer weather! Have a professional check your electrical wiring, especially if you use fans in warmer weather. Clean, repair, and carefully store your winter blankets. Take your trailer in for yearly service, including tire safety and braking systems checks. Clean out your grooming supply buckets – all of that spring shed hair loves to collect in there! Implement a tick control program. Collect manure samples for a worm check from your vet’s office. Clean and condition tack, as well as double checking stitching and buckles. BarnManager can help you make your spring cleaning list, set due dates, and assign tasks to your team members. To try a free trial of our barn management software click here. Then go out and embrace the fact that spring is finally here! Time to celebrate riding without those huge winter jackets!